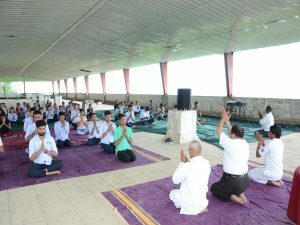 Yoga session in KGRDCP & RI, Karjat. Mr. Prakash Kumbhar, Mr. Shashidharan Acharya, Mr. Ghodake were present . The programme started with Gayatri Mantra. They taugh about Vinyasa for weight loss, Bikram for flexibility , Ashtanga for body strength. Shri Waman Sonane had given emphasis of importance of yoga to increase concentration ,relief from mental stress. 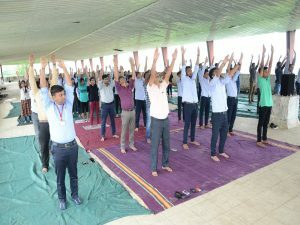 They also conducted session on Surya Namaskar.. They have taken practical session of yoga like Vakrasan,Uchatadasn, Matsyasan. Dr. M. K. Kale, Principal, Dr. Prabhakar Shirodkar Research Director, faculty members, supporting staff and students were present on this occasion. Mrs.Jyoti Lahane was convener for this event.